It’s the season for giving thanks, and this November, we are thankful for social connections of all kinds, whether in person or electronic. 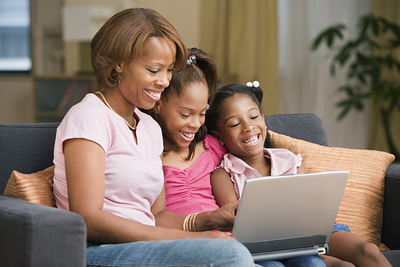 Media can affect children’s interpersonal connections in many ways, whether by facilitating those connections (like a video chat) or impeding them (when media distract from in-person interaction). In this issue, we look at how putting media aside can help parents contribute to a young child’s brain architecture (see The Tips), how grandparents can contribute to a grandchild’s gaming plan (see The Q&A), and how one study shows that when parents “friend” their young adult children on social networking sites, they can improve parent/child relationships (see The Research). Cherish those parent-child interactions–your child’s brain does. Baby talk, peek-a-boo, or any of your attentive ‘serve and return‘ interactions are more important than you might think. Reciprocal exchanges such as responding to your child with similar facial expressions and sounds help shape the developing brain. Appropriate adult responses to a baby’s attempts to engage help build a young child’s brain architecture, while absence of these healthy interactions can disrupt learning, behavior, and health. Don’t go cold turkey this holiday season–try making incremental media changes. The holidays can provide opportunities for families to share extra leisure time around the house, but TVs on in the background can be a conversation stopper. To increase connections, try taking media influences down a notch. If you have a TV that is on most of the time, try going with volume only or picture only and see whether that affects the quality of your interactions. Also note that sometimes teens feel more comfortable talking when the conversation is buffered by a slight distraction, so instead of a screen-media distraction, consider driving in a car, walking together, or playing board games. When making positive steps toward building parent-child bonds, incremental changes add up over time–patience and gratitude count! and his parents don’t seem to mind–what can I do? ?